2 incredible programs on one disc! A comedy TV show and musical comedy film. This DVD contains 2 incredible programs featuring Dean Martin (1917-1995), one of the most famous music artists of the 1950s and 1960s. 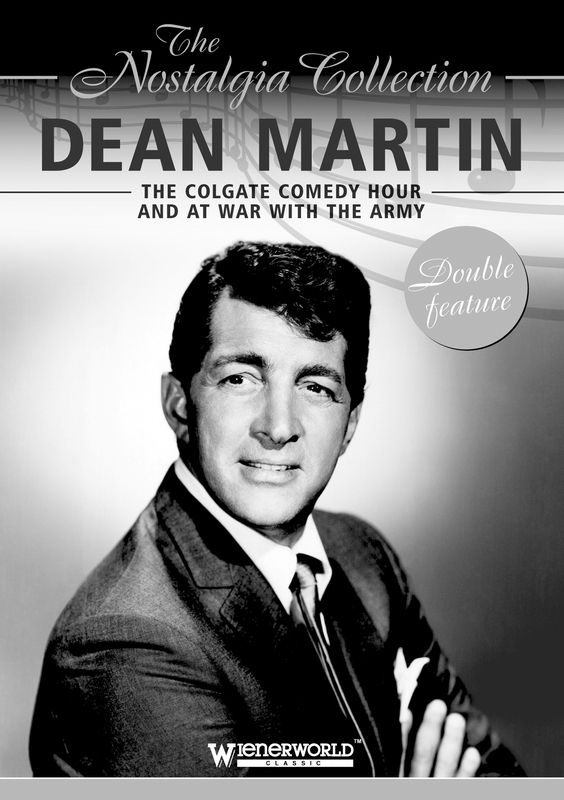 COLGATE COMEDY HOUR: This popular American show, spanning five years, was hosted by Dean Martin and Jerry Lewis, and gave Martin the notoriety to continue in a solo career ten years later. It starred many notable comedians and light entertainers of the era, with this episode featuring Janis Paige, Danny Arnold and Johnny Conrad Dancers. AT WAR WITH THE ARMY: Dean Martin and Jerry Lewis star as Sergeant Puccinelli and Private Korwin in this musical comedy. While Puccinelli desperately wants to transfer to a more active role overseas, all Korwin is interested in is seeing his wife and new baby, whilst at the same time avoiding the wrath of Sergeant McVey (Mike Kellin). Complete with songs along the way, they also recreate a scene from Going My Way where they imitate Bing Crosby and Barry Fitzgerald. Known as a singer, a performer, and an actor on stage and on the screen, Martin was a delight to an ever-growing audience. Several of his songs have hit the charts posthumously and he was also awarded a gold record in 2004 for his fastest-selling album. Dean Martin (1917-1995) was one of the most famous music artists of the 1950s and 1960s.